Sreemati Chakrabarti is the editor of the China Report. She was a Professor of Chinese Studies and Head (Chair), Department of East Asian Studies, University of Delhi. Currently, she also holds the position of Dean (Social Sciences) in the same University. She has been Honorary Fellow of the Institute of Chinese Studies, Delhi since 2003. In 2015 she became Vice-Chairperson of the Institute. Between 2009 to 2012 she was also Honorary Director, Institute of Chinese Studies, Delhi. She has a Ph. D in Political Science from Columbia University and holds Master’s degrees from Delhi University (Political Science) and Harvard University (Regional Studies – East Asia). She has done post-doctoral research at Beijing Normal University. She was the Book Review Editor of the Sage journal China Report from 2007-2013. Her publications include China and the Naxalites (1990), Mao, China’s Intellectuals and the Cultural Revolution (1998), Taiwan Today (2007, edited with Anita Sharma) and a National Book Trust document, China (2007).She has also published a number of China-related chapters, articles and write-ups in books, journals and newspapers, respectively. On academic assignments she has traveled to Russia, Japan, South Korea, Taiwan, Hong Kong, Nepal, the United States, and several times to China. She is on various China-related panels in Indian universities and government-run research and educational organizations. Several television and radio news channels, including the BBC, invite her to comment on issues concerned with China and East Asia. In the year 2010, then Chinese Premier Wen Jiabao felicitated her with the China-India Friendship Award. 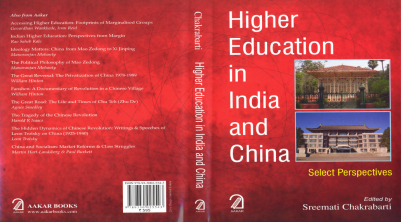 This is a study of the higher education scene in India and China in the era of globalization. The Chapters focus on the transformation that has taken place in the last three decades in India and China when they have attempted to boost and promote higher education to match their developmental efforts. The PRC’s achievements in basic education, in comparison with most developing countries, have not been disputed. At Liberation in 1949 the literacy rate was less than twenty percent and by the turn of the century it reached eighty-five percent.